Lotus Childrens’ Centre is committed to making a positive difference in the lives of children. Our center is a demonstration project that offers a home for orphaned and disadvantaged girls, as well as nursery school facilities and a childrens’ library. Our focus is on developing individuals who are creative, confidant and caring. Living in a neighborhood full of primary and secondary schools, you know summer has passed when right around the same time every day, a sea of multi-colored uniformed children flood the streets; Green and yellow polka dots, bold maroons and golds, pink and green stripes and of course, the red, white and blue of Lotus Nursery School. The children at Lotus this year are a varied bunch themselves, ranging from a few sweet 2 year olds to some very mature 6 year olds. As always with the coming of a new school year, we’ve waved goodbye to those off to primary school and have welcomed some new faces as well. The school underwent some renovations over the summer including tiling of the classroom floor and bathroom, the re-paving of the driveway and compound walls, new plumbing in the bathrooms and a newly painted swing-set. 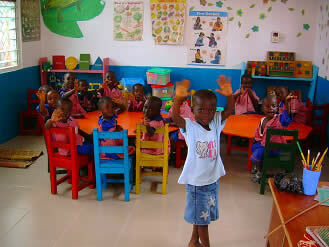 The classroom itself has also been painted and the children have been supplied with new toys and project materials. The class waving “hello” on their first day of school. Along with the changes to the school, the curriculum (Circle of Love) is currently undergoing some re-structuring in regards to a stronger emphasis on arts and crafts to spark creativity and story reading (both in groups and individually). The children are being encouraged to orally present their work so as to strengthen their confidence and promote verbal articulation. The children will also be practicing simple meditation and yoga exercises in the mornings to enhance their concentration during the day’s classes. Finally, the children will also develop their knowledge and appreciation for nature with lessons on living things, non-living things and the world around them. Beyond the nursery school, the current volunteers (us) are in the process of planning a community cleanup of the local football field and the installation of goalposts for the enjoyment of the neighborhood kids. This will also provide a larger space for the Lotus School’s students to play in on Sport Fridays. 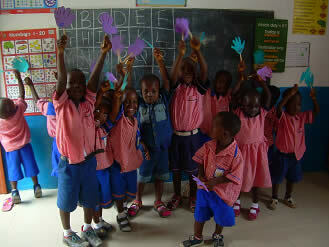 We hope that as they learn and grow, the children will embrace these opportunities to express themselves creatively. We are very excited for the coming year and look forward to working and interacting with the children and community of Soko.